A workplace injury is an extremely painful experience for the victim as well as his entire family. In addition to the physical trauma, a workplace injury brings a lot of stress and anxiety for the family, as it more often than not leads to loss of job and wages. If you or one of your family members has suffered an injury at the workplace in Minnesota, call me at (612) 236-1320. 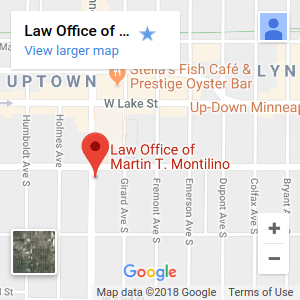 I am Martin T Montilino and I am a workplace injury attorney, with over sixteen years of experience in representing injured clients and ensuring that they have been compensated for loss due to injuries at work. I understand that a person who has suffered injury at work is worried about medical expenses and the loss of job. This is why I beleive that many workers wonder can workers comp stop paying without notice? First and foremost, you need to be aware of your rights. As per the law in Minnesota, workers are provided compensation to provide for themselves and their dependants. You can avail of benefits such as compensation for wage loss, medical reimbursement, vocational rehabilitation and also partial and permanent disability benefits. In fact, I would strongly urge you not to delay but to call me immediately. I will personally talk to you and ensure that your claims are paid at the earliest. In case you have been scheduled for your Independent Medical Examine (IME) you should be properly represented before you meet with the insurance company’s doctor. A common ploy used by insurance companies is to claim that the injured worker’s injury is caused by previous injury or aging and hence does not come under work-related injury. If you are properly represented, your legal counsel can establish without further doubt that your injury is work related and back it up with medical evidence, so that you can avail compensation as decreed by the Minnesota Workers’ Compensation Act. During the last 16 years, I have represented numerous individuals with different injuries and from different professions. Whatever your occupation; I will listen to you carefully and fight for your rights. I have a lot of experience in court and am familiar with the legal process. Moreover I have extensive contacts with medical specialists and professionals whom I consult to decide the merits of the case and can help you win the best possible compensation. CALL NOW! I understand that a person who has suffered injury at work is worried about medical expenses and the loss of job. First and foremost, you need to be aware of your rights. As per the law in Minnesota, workers are provided compensation to provide for themselves and their dependants. You can avail of benefits such as compensation for wage loss, medical reimbursement, vocational rehabilitation and also partial and permanent disability benefits.